Webmasters Choice: After being in the fan business for over 25 years, it takes a lot for a ceiling fan to impress me. The combination of strikingly unique design and super high performance makes this one of my all time favorites. If you think this fan looks good in the picture, just wait until you see how incredible it looks in your home! Shown in Picture: We added the BOND Wi-Fi device to the popular Minka Aire Artemis to create the ultimate Wi-Fi enabled ceiling fan for your smart home. Bond gives you complete control of this fan from any smart device as well as from Alexa or Google Home. Just say "Alexa (or Hey Google) turn on living room fan" or something like that, and your fan will turn on. This is the Minka Aire Artemis XL5 LED Ceiling Fan Model F905L-DK in Distressed Koa. The fan includes an Integrated LED Fixture: 3000K Color Temp; 80 CRI; 1550 Lumens (75 watt equivalent) with Opal Glass. The fixture uses 1-17 Watt LED Array. The Artemis XL5 LED is a contemporary style ceiling fan designed for use Indoors Only. This fan features a Super Efficient DC 172mm x 25mm Motor with a 24 Degree Blade Pitch producing an AirFlow rating of 5 (where 5 is best). It is operated by a 6 Speed Remote Control. Other types of controls are also available. Minka Aire has taken the Artemis and given it a booster shot to create the new Artemis XL5. Featuring the same top selling style as the Artemis, the Artemis XL5 is a slightly larger fan with 5 blades instead of 3. Adding a super efficient DC motor allows the fan to have 6 speeds instead of 3 and move more air while using less electricity. This is stunning contemporary style ceiling fan with a sleek design that includes a low profile built-in light fixture. The high density molded plastic blades completely cover the motor inside creating the illusion that the blades and body are one piece. A truly innovative and striking design. Now...go ahead...treat yourself! Downlight Description Integrated Dimmable LED Fixture with White Opal Glass. CRI: 80, Kelvin 2700K, Lumens: 1100 (near equivalent to 75 watt incandescent). UL Listed for Indoor use only: The Minka Aire Artemis XL5 LED - BOND WiFi is UL Listed for Indoor use only, so it is not designed to be exposed to moisture or harsh elements. Do not install this fan outside your house. It is also not recommended for bathrooms that have a shower or tub or laundry rooms, both of which produce excessive amounts of moisture. 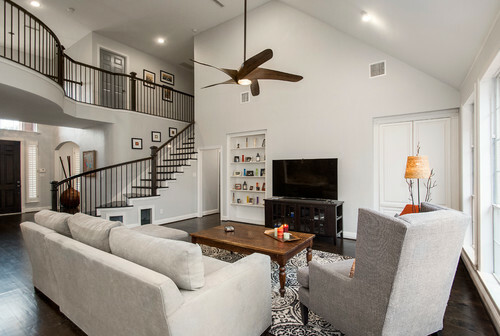 Minimum Ceiling Height Requirement: Building codes require residential ceiling fans to be installed with the blades at least 7 feet from the floor. 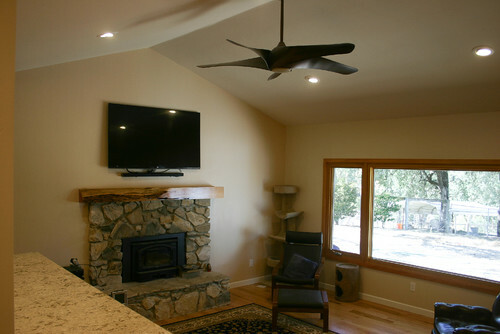 In order to meet this requirement, this fan requires a minimum ceiling height of at least 97.75". If your ceiling is lower than 97.75" then you may need to add a flushmount adapter or close to ceiling downrod if one is available for the fan (see below). The light fixture that comes with the fan is allowed to be less than 7 feet from the floor, so just make sure you have enough headroom to walk under it if need be. If you cannot find what you need to make this fan work in your room, please give us a call 1-800-201-1193 so we can check to see if there are any further alternatives. The downrod included with the Minka Aire Artemis XL5 LED - BOND WiFi ceiling fan is 6", which puts the blades 14" from the ceiling. Here are the Minimum Ceiling Heights required for each downrod available for this fan. Each length will put the fan blades 7 feet from the floor, so if you want your fan blades higher than 7 feet, choose a shorter downrod to fit your needs. How does the Minka Aire Artemis XL5 LED - BOND WiFi Compare to the Average Ceiling Fan? A Wind Speed Factor of 3.89 MPH gives this fan a Breeze Rating of 5 out of 5. This is a stronger breeze than most ceiling fans, so if you are looking for a fan to keep you cool, the Artemis XL5 LED - BOND Wi-Fi great choice. Keep in mind that fans with a large blade span like this one may move lots of air when it comes to CFM (Cubic Feet per Minute), but the airflow is spread over a larger area, so the actual concentration of the airflow (wind speed) is usually less than that of normal size fans. For the best wind-chill effect in larger rooms you may want to consider two or more smaller fans (50" to 56") that have a significantly higher wind speed factor. However, if you can only install a single fan, a larger fan like this may be a reasonable compromise. Just don't expect to feel as much breeze as the abnormally high CFM rating leads you to believe. Aside from Quality, which accounts for smooth quiet operation and durability, the amount of wind-chill a fan can provide to cool you off is the most important consideration. WOW...the Minka Aire Artemis XL5 LED - BOND WiFi moves a whopping 9160 CFM of air with a Wind Speed of 3.89 MPH. This is a huge amount of air considering the airflow of an average ceiling fan is just 5755 CFM! The 3.89 MPH wind speed is a little lower than you might expect with such a high airflow. The wind speed tells you how much breeze you can expect to feel when you are beneath the fan. Due to the blade span of this fan, the actual concentration of airflow is spread over a larger area, so the ultimate cooling effect is a little less than some fans with smaller blade spans. This is a compromise that you may be willing to accept if the actual area where you spend your time is further away from the center of the fan, which is why you may consider a larger fan such as this one. In this case the Minka Aire Artemis XL5 LED - BOND WiFi will allow you to raise your thermostat by 1 or 2 degrees, which will still help you save additional money on your cooling bills (if you have AC). 39 Watts per hour is "Extremely Low", which is fantastic because the Minka Aire Artemis XL5 LED - BOND WiFi will cost almost nothing to operate compared to other ceiling fans. Use the calculator below to estimate just how much it will cost to operate this fan in "Your home". Basic Help: Our operational cost calculator estimates how much it will cost to operate the Minka Aire Artemis XL5 LED - BOND WiFi ceiling fan. By default, the calculator assumes that you will leave your fan running 24 hours a day for the entire year (which is not very likely to be accurate), so you will want to change the hours and days to be more in line with how often you think you will use the fan. The calculator also defaults to the average cost per kWh of electricity in the USA. You can change this to use the average cost of electricity in your state, although this may vary widely from city to city. For the most accurate calculation, manually enter the actual cost/kWh shown on your utility bill. The wattage of the fan is already included (if it is known), but you can change it if you wish to see how the wattage affects the cost. Can this be mounted on a sloped ceilinng?